Saw this posted online. These are "full scholarship equivalencies" for all NCAA athletic teams at that school. Thank VERY MUCH for this info! More clear evidence that ESU football issues are fixable, but will require a large-scale program overhaul. Here are the keys Jimmy, good luck! Right. I am more saying that should they so choose, ESU could prioritize having a decent football program. They're not necessarily hemmed in by the same constraints as some of the other cellar dwellers. I can't find the latest numbers. Could be interesting to see what % of total scholarships goes to football at each school. I am personally embarrassed that UPJ, without football, gives out more scholarship equivalencies than Shippensburg. So should WCU. That's ridiculous. Also would be curious to know how much of Mercyhurst's money goes out to ice hockey. Both Erie schools pump a lot in to men's and women's basketball. Wrestling rules the roost at UPJ. That would be me, for one! Last I'd heard, Ship's Matt Jones had one (1) scholarship equivalency to divvy up among his roster. Which makes their perennial standing as a regional power rather remarkable. That's 'fairly' common in baseball in the PSAC, correct? Perhaps more than (1) but not much more. The way IUP treats baseball ... they are lucky they have uniforms. I'm not sure what it's like for the other schools, but I wouldn't be surprised if that's the case. Although I'm pretty sure Mercyhurst and Seton Hill are giving out considerably more than the rest. Seton Hill's a rising giant in D-II baseball. I bet Clarion, Boro, and Lock Haven give the full 9.9 for D1 wrestling, and Pitt Johnstown probably gives the full 9 for D2 wrestling. it would be nice to see break down by sport. Wow, I had no idea wrestling gave so few scholarships. What's the average roster size ... at least 30-some, right? I've seen the men's and women's basketball breakdowns before ... the disparity, per capita, is similar to football. Yes most teams have 30 or so wrestlers in the room and there are 10 "starters" so not even 1 scholarship for every weight class in D1 (10). The thing that I find funny is the difference between D1 (9.9 and D2 (9). What I would find interesting is not just seeing each schools breakdown, but also seeing where they are competitively in that sport over the years would be fascinating to me. I'd love to see this for all PSAC sports. Then also see how it compares to the perennial powers elsewhere. Mercyhurst awards more football scholarships than Lock Haven awards athletic scholarships. Last edited by Fightingscot82; 10-29-2018 at 01:37 PM. Wow. That's bleak. Really ... bleak. It’s no secret Foosball is #1 at IUP. IUP is giving out 65 total with 25.5 going to football. Men's and Women's basketball are getting another 18-19 of those. So, that's about 20 left to spread across all the other sports. I'm actually surprised the other sports are getting 20. I actually have those numbers. 8.03 for men's basketball and 9.24 for women's basketball. 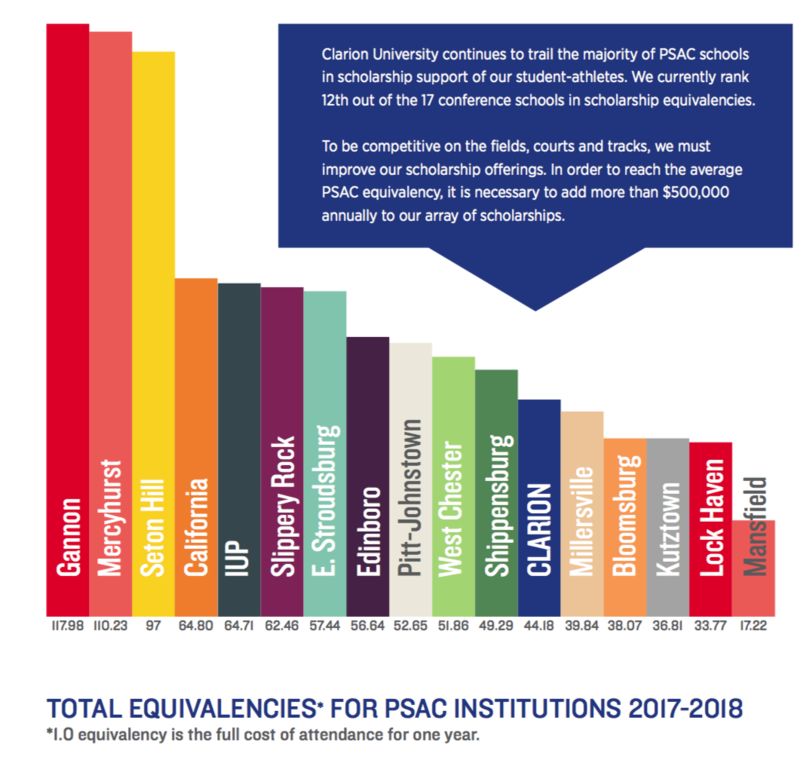 IUP spends 65.94% of their athletic scholarships on football and basketball.